Completes Cleansing and restores the Ph of the skin. For the most oily and acne prone skin - glycerin and alcohol free. Formulated with fresh leaf extract and oil of Eucalyptus, this delicately stimulating toning lotion with its invigorating aroma balances the skin and eliminates all traces of impurities. It's astringent and anti-seborrhea qualities tighten the pores and leaves the complexion shine-free. Our premier age-revitalizing serum now includes three new extraordinary age repair ingredients: Stem cells cultured from citrus and two plants - Enteromorpha compressa & Caesalpina spinosa gum. Key ingredients remaining in the serums are regenerating antioxidants such as skin soluble Vitamin C, superoxide dismutase, CoQ10, curcuminoids from turmeric and phenol-rich herbs, Rice derived peptides and phytoplankton enzymes are also present to support skin structure and help repair damaged DNA. Other ingredients keep skin hydrated, supple and smooth. Phyto-Infusion II has a 5% neroli distillate to better support normal or oily skin. Phyto-Infusion I & II contain the same active ingredients, however Phyto I includes additional moisturizers making it more suitable for dryer skin. 100% active ingredients, ISUN Age Prevention facial oils are excellent for any age to restore and maintain healthy, balanced skin and to prevent environmental aging effects. Three age prevention oils designed for individual skin types are blends of concentrated herb-infused oils and essential oils and uniquely include a corresponding gemstone inside the bottle. Each oil contains blends rich in phyto-antioxidants with herbs and oils specifically formulated for each product to bring a healthy balance and radiance for each individual skin types. 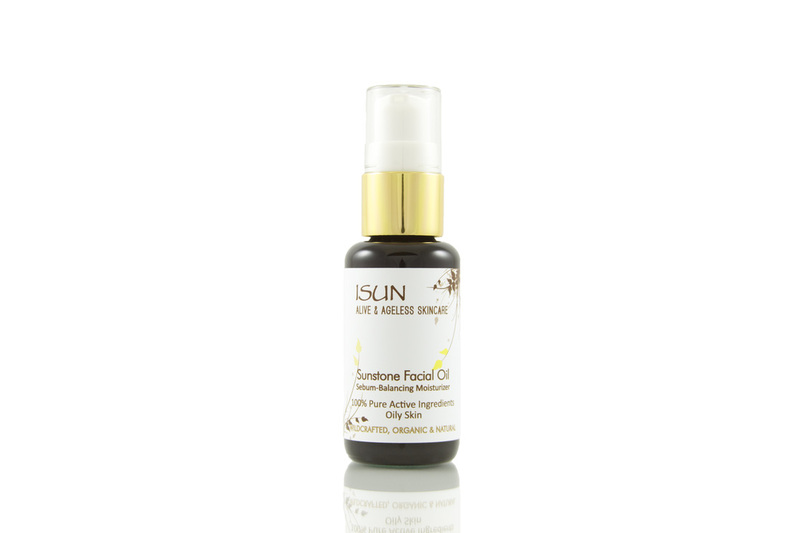 Sunstone Facial Oil contains sebum-balancing and astringent herbs and oils that are well absorbed to help slow down excess oil secretion (sebum), yet promote a healthy moisture balance for oily skin. Powerful and versatile antural antiseptic. Purifies and stimulates the epidermis. Can be used on face, body, hair and also as mouth rinse or foot bath (diluted in water). For pimples, spots use neat as a treatment. Can also be used for cuts, bites or stings. The distinctive aroma of pure organic neem and tulsi oils from India combined with the natural fragrance of antimicrobial essential oils and herbs tells you immediately this mask is a powerful skin-purifier. Neem, tulsi and a concentrated organic infusion of antimicrobial, antioxidant and anti-inflammatory herbs are blended into mineral-rich Morrocan rhassoul clay for powerful skin purifying benefits. An effective level of antimicrobial ingredients is strong and some individuals may feel a tingling sensation at first. This goes away as the mask dries. The ‘tingle’ lets you know themask is working. If your skin is sensitive, we suggest you create your own mask by blending 50% Rhasoul-Neem and 50% Blue Green Algae masks.